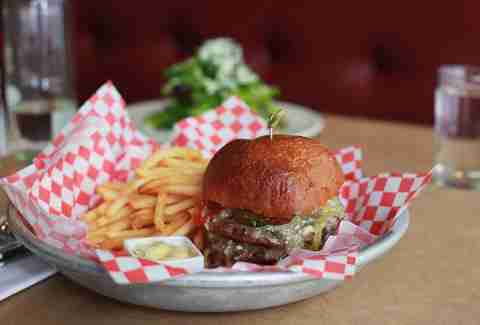 At its core, a good burger is about the unadulterated stuff kept simple. We’re talking at least one juicy meat patty coated with sauce, crispy pickles, fresh tomato, and a nice set of buns to soak it all up. If that sounds dirty, it’s only because eating a fantastic burger is the closest you can get to getting off in public without drawing too much attention to yourself -- and that is a privilege, friends. While topical burgers may come and go (do you honestly need an extra helping of duck liver on your patty? ), the classics that stole our hearts will always remain. So without any further ado, here are the best, sexiest burgers you can get your hands on in Portland today. 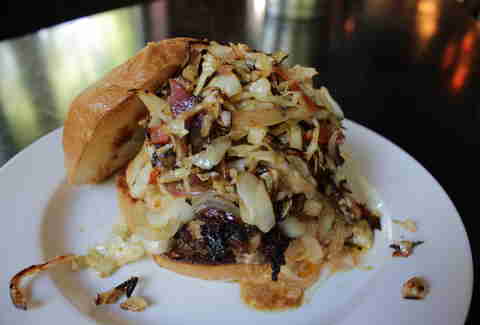 Out of all the burgers in Portland -- greasy, trendy, spicy to the bone -- this one reigns supreme. While most are cheddar/American cheese happy, this burger is a cut above the rest, due in part to the deliciously nutty manchego cheese that cuts through to your taste buds instantly. The patty is oh-so-moist without dripping a gallon of juice onto the plate; the bacon adds more meaty texture; and the pickles are actually homemade zucchini pickles... because no decent burger is complete without tangy pickles, damnit. 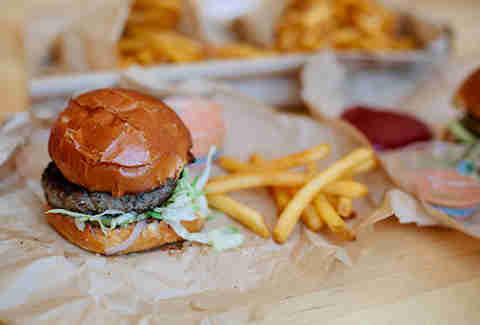 TILT's claim to fame is "food and drink for the American workplace," which is secretly code for "burgers you want to stuff in your mouth as quickly as possible." While a quick glance at the menu is enough to make even the most timid burger lover hot and bothered, the Woody Royale is the king. It’s a giant helping of a chuck patty topped with an onion ring, tender brisket, jalapeño slaw, bacon, and sharp cheddar that manages to hit a variety of notes -- sweet and spicy, hints of smokiness in the bacon -- before it makes you shout, "AAAAH, YES, AT LAST," in public. The slaw offers great relief against the triple-meat surprise, combining with sharp cheddar for a perfect creamy finish. Doug Fir is so much more than just a venue. It’s also home to a special bacon-topped beauty called the Candied Bacon Burger, a delightful concoction with a wagyu beef patty thrown together with fried onion straws, Gruyere cheese, a roasted shallot aioli, and, of course, candied bacon. This candied bacon is everything you’ve ever wanted in bacon: tenderly smoked, caramelized to perfection, and with great texture and sweetness that plays nicely against the wagyu patty. The best part about this burger is that it’s well-balanced, so you can taste the quality of the patty without it being overwhelmed by the bacon. Bonus points to the nicely spiced, hand-breaded shoestring onions, the house-made pickles, and those impressive buns, for staying buttery and fluffy despite so much meat. 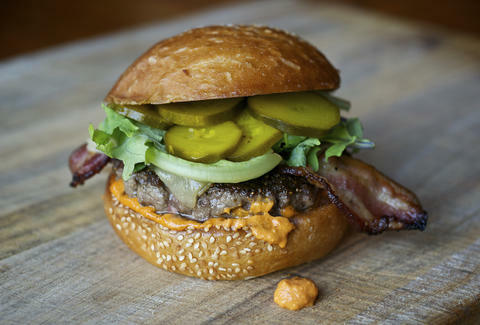 Fancy burgers crop up now and then, but Little Big Burger is a hamburger purist’s dream. It’s a cheap, deliciously simple vision of patty-meets-bun, complete with a ¼lb burger made of Cascade beef, brioche buns, and its signature Camden’s ketchup -- a notch above all other ketchups in quality and taste. You can get fancy add-ons like goat’s cheese or bacon, but really, this is a patty best savored in its simplest form. The first thing you see are the Los Roast Hatch chiles, which not only make for a pretty plate but adds worlds of flavor. The chilies are sweet, with a hint of spice that builds without being overwhelming, and are paired with a creamy queso botanero that’s infused in-house with more chilis. The boar patty itself isn’t gamy, but rather tastes like a mouthwatering combination of beef and pork. Add the lightly pickled jalapeños and a Grand Central potato bun to the mix for one hell of an addicting burger you’ll be coming back for time and time again. Hobnob Grille knows how to make a mean burger. All of the patties are made with a combination of select black Angus top sirloin, chuck, and applewood smoked bacon, meaning that the patty itself is the star of the show around these parts. If that isn’t quite enough protein for you, the brisket burger adds on a layer of Hobnob’s BBQ brisket for an extra dose of smoky, caramelized meat piled on high. The Thousand Island dressing gives a much-needed counterpoint against the daunting tower of meat, and a layer of Swiss blankets the entire thing in melty delight. The slaw on here has nice hints of charring, so even your veggies are a thing of wonder. Bonus: Hobnob introduces new burgers pretty often, so check out the specials each week for more awe-inspiring burger selections. 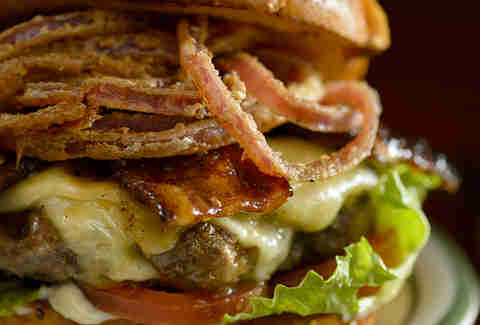 Just looking at this burger is enough to send hearts into overdrive. An homage to the humble In-N-Out burger on steroids, this voluptuous burger consists of two giant patties topped with American cheese and cooked medium rare. The patties are incredibly moist and give off their own juices that blend with the house sauce and cheese for a creamy, dreamy bite of heaven. The sesame seed brioche bun is also perfectly buttered, and the pickles (made in-house, of course) are packed with lightly spiced, zesty flavor. Get this thing in your mouth NOW. For a mere $5 during happy hour, this burger is an absolute steal. It’s not one, but two generously sized patties nestled between lightly charred brioche buns and topped off with a nice helping of brie cheese, pickles, and spiced ketchup. The brie adds a nice tang and makes the entire ensemble extra decadent and creamy, which -- especially when paired with the spiced ketchup -- is a recipe for a happy hour burger we’d be happy to devour just about any day. Janelle Albukhari is a food & travel writer with an insatiable appetite for adventure (and copious amounts of burgers). Follow her on Twitter @jenkhari.